Three years ago when I jumped back into cycling and mountain biking I would never have imagined myself a person to take Cycling Supplements. My prior experience with supplements was lifting weights in my youth resulted in an expensive habit that didn’t accomplish anything that a good diet could not accomplish. Well last year I saw a radical change in my physiology. I was down to 190 pounds from 270 pounds when this all started. I felt awesome, I was riding nearly every night then on weekends I was riding twice per day. I would do a fast 20 miles on the road then come home rest for an hour or two then head out mountain biking. All was good but I noticed something my times were not improving. It’s not like I was trying to break any records or anything but dammit I was working hard and eating right but was not really making any noticeable gains. Separately I had discussions with my super fit 22 year old niece and muscular nephew of the same age who suggested some supplements. I thought about it, did some research homework on Cycling Supplements and thought what the heck. That research resulted in a few purchases of Cycling Supplements that would forever change my opinion of supplements in general. Within two weeks I broke my plateau and crushed my previous personal best times. Below is a list of everything I currently take. You can follow the links below to Amazon and read all the reviews and info for yourself. Optimum Nutrition Creatine Powder -Take as Directed. I use this in my protein shakes and fruit smoothies. 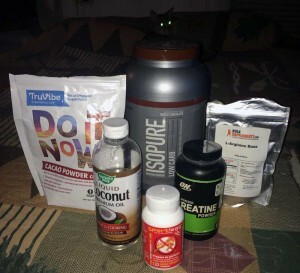 L-Arginine Base Powder – Take as Directed. I use this in my protein shakes and fruit smoothies. TruVibe 100% Organic Raw Cacao Powder, Fair Trade, 1lb (16oz), Criollo Cacao Variety – This is my first choice for Cacao Powder. Take as Directed. I use this in my protein shakes and fruit smoothies. Healthworks Raw Certified Organic Cacao Powder – This is my second choice for Cacao Powder. Take as Directed. I use this in my protein shakes and fruit smoothies. Nature’s Way Liquid Coconut Oil – I use this in Protein shakes as it is always in a liquid form which is perfect in my Blender Bottle. It tastes good but not as tasty as the Viva Labs. I purchase both. Nature’s Best Low Carb Isopure, Dutch Chocolate – This is my protein of choice. I mix it in the blender bottle or fruit smoothies. The vanilla version “Nature’s Best Perfect Zero Carb Isopure, Creamy Vanilla” is obviously zero carb. I dont like vanilla. NextSchrader Valves vs Presta Valves | Whats the Difference?